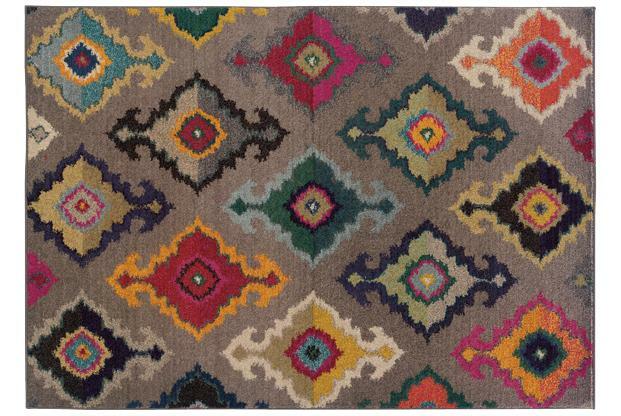 The Kaleidscope 5x8 Rug by Oriental Weavers at Miskelly Furniture in the Jackson, Pearl, Madison, Ridgeland, Flowood Mississippi area. Product availability may vary. Contact us for the most current availability on this product. The Kaleidoscope Collection showcases bright, vibrant colors of sunshine yellow, tangerine, hot pink, and bright poppy, while ultramarine blue, citron and chartreuse round out the assortment, giving the playful colors a dramatic effect. The machine-woven collection of textured polypropylene offers an antiqued, yet modern day aesthetic with shade upon shade and texture upon texture. Colors may not be 100% accurate do to printing and monitor limitations. The Kaleidscope collection is a great option if you are looking for Rugs in the Jackson, Pearl, Madison, Ridgeland, Flowood Mississippi area. Browse other items in the Kaleidscope collection from Miskelly Furniture in the Jackson, Pearl, Madison, Ridgeland, Flowood Mississippi area.